As now, an important building in Sun Street in 1851 was the “Sun”. The 1851 census demonstrates that not everyone in Hitchin was Hertfordshire born and bred. It recorded the innkeeper, William Hill, born in Lancashire, with his wife, born in Bermondsey, and their son, another William, who was one year old. There were two commercial travellers staying on census night, one born in Normandy and another from Huddersfield. The “Sun” was a major employer with William Jeeves, enumerated as “servant, boots”, 2 post boys, an ostler, barmaid, cook, chambermaid, waiter and 3 other general servants. 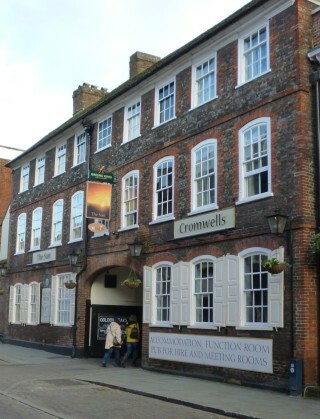 Another inn, the “The Angel”, was nearby, run by Thomas Lowden. The street was both commercial and residential with many tradesmen and their families “living above the shop”. 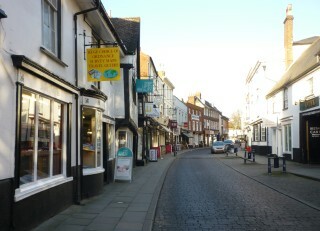 They included some familiar Hitchin names such as the surgeon and apothecary, Richard Shillitoe, and his family; the maltster, Joseph Lucas and his family; Charles and Thomas Paternoster, the printers and stationers, with their sister, Eliza, who the census described as living on the interest of money and William Hawkins, the solicitor. William Ransom, the manufacturing chemist, was also there. He opened his chemist’s shop in Sun Street in 1846, later moving to premises in Bancroft. Another well known Hitchin name is Gatward. There were two households, one headed by C Wilson Gatward, a watchmaker and jeweller, living with his two unmarried sisters and the other was headed by the widow, Frances Gatward, recorded as a shopkeeper, although trade directory for 1851 is more specific with the business described as a “Toy Warehouse”. Women headed three other concerns in Sun Street. Mrs Charlotte Langford, a widow with a young family was enumerated as a cabinet maker, Neal and White, the drapers, was a partnership between James Neal and Mary White and Ann Palmer was a draper and milliner, employing her niece and nephew plus 2 dressmakers, 2 milliners, an apprentice and two servants. Other traders in the street were James Clark, the boot and shoe maker, George Gregory a grocer and corn dealer, Thomas Hall a butcher, William and Joseph Hall, ropemakers, George Jackson, the auctioneer, James Kent, a plumber and glazier and a tailor, John Walker. By 1890 the “Sun Hotel” was managed by Edwin Logsdon. The household comprised his wife and 4 children plus William Baird, enumerated as a brewery pupil, 2 barmaids, 2 servants and a yardman, boots and James Matthews recorded as a “boots and billiard marker”. George Moules was at “The Angel”, and although described as a hotel keeper on the 1891 census, this continued to be a smaller establishment with just one general servant, Emily Pates. The Lucases still had a brewing business based in Sun Street but the family were now living at “The Firs” in Bedford Road with William Lucas enumerated in 1891 as Brewer and JP for Herts. Similarly, Caleb Soundy, a draper, had a shop in Sun Street but he and his wife lived at Southwold Villa, Walsworth Road. 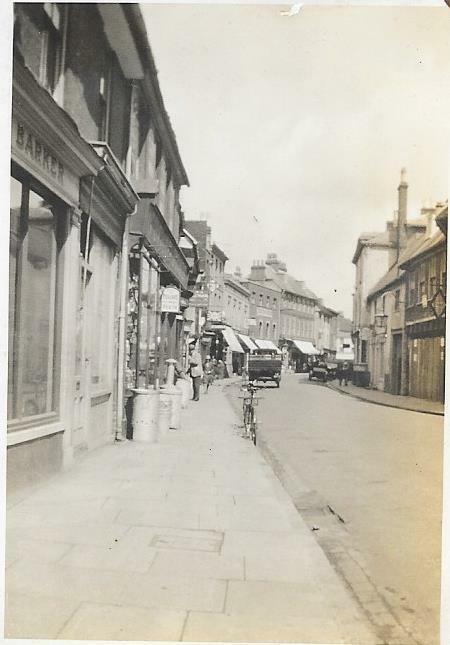 William Piercy at number 30 and William Potts at numbers 21 – 23 also had drapers shops. The Paternosters were also still in Sun Street. Charles Paternoster was at numbers 27 – 28 and enumerated as an ironmonger and engineer; his sister, Sarah, as a stationer. Other trades included a greengrocer, tailor, bootmaker, jeweller, gunmaker, ironmonger, tobacconist and George Webb, the chemist. An indication of the start of chain stores is indicated by the presence of the International Tea Company and the Three Counties Supply Stores, patent medicine vendors and provision dealers. By 1911 the “Angel” and the “Sun” were still providing hospitality with the Conservative Club next door. The street continued to have a variety of trades with many families living at their place of work but Kelly’s Directory for Hertfordshire for the preceding year uncovers some who were not. Elizabeth Gilham had a boot and shoe warehouse at number 2, Oliver Odell was a house furnisher at number 18 and Percy Rodwell was an antiquarian dealer at number 6. George Webb’s chemist and druggist shop had been taken over by his son, Edward. The Webbs were still in Sun Street in the 1920s. 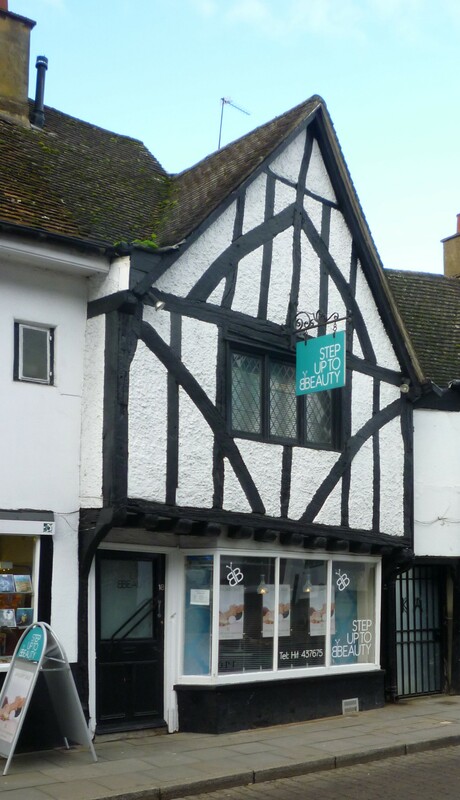 Kelly’s Directory for Hertfordshire for 1926 has George Webb, the chemist and druggist at number 30 and Frank Webb, an optician, at number 32. Mrs Mary Ann Cooper was running the “Angel” and Samuel Reginald Beechey the “Sun Family and Commercial Hotel”. Thomas Brooker and sons were the ironmongers at number 14 and Paternoster and Hales continued to have a presence at number 27. New trades had appeared. Harry Buckler, an electrical engineer, had an office and showrooms for wireless sets and William Rollason was a gramophone dealer. Miss Gertrude Pearce’s wool shop makes its first appearance in this directory. It was at number 18 in what is probably one of the smallest and oldest buildings in Sun Street. In addition to wool and patterns she sold “fancy goods” such as china ornaments and a few children’s books. (The photographs of the shop and of Sun Street were taken by her nephew, Sam Ayto, around 1930). She ran the shop for some 30 years, retiring when she was in her 80s. 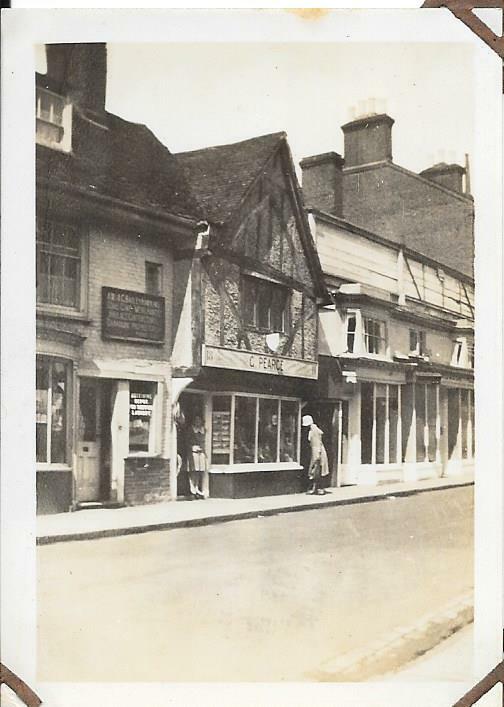 Her shop and many others were remembered by Miss Latchmore in her memories of Hitchin published in 1974. E Aillie Latchmore, “People, Places and Past Times of Hitchin”, 1974, is available at Hitchin Library and for reference only at HALS. The licensees for the “Sun” and the “Angel” from 1806 – 1952 can be found on Hertfordshire Names Online. Enter Sun Hitchin or Angel Hitchin as keywords and the names are under the Miscellaneous category. This page was added on 21/12/2015. Looking for historical info on the former Conservative Club (now the Angel Vaults) – can anyone point me in the right direction please?